Private collection, Switzerland; sale, Christie's, London, 21 June 2005, lot 42. C. Zervos, Pablo Picasso, Paris, 1978, vol. 33, no. 281 (illustrated, pl. 97; dated 20 January 1972). Picasso: The Avignon Paintings, exh. cat., The Pace Gallery, New York, 1981, p. 6 (illustrated in situ in the 1973 Palais des Papes exhibition). The Picasso Project, ed., Picasso's Paintings, Watercolors, Drawings and Sculpture: The Final Years, 1970-1973, San Francisco, 2004, p. 270, no. 72-016 (illustrated; dated 20 January 1972). Avignon, Palais des Papes, Picasso, 1970-1972, May-September 1973, pp. 232 and 235, no. 158 (illustrated in color, p. 189; dated 20 January 1972). Nassau County Museum of Art, Long Island Collections, January-March 2009. On 23 May 1973, a large exhibition was opened at the Palais des Papes in Avignon comprising works from the past three years by Pablo Picasso, each one selected by the artist himself. Tête d'homme was one of the works in this show which was to become a posthumous survey of Picasso's recent works, as he died on 8 April that year, after the exhibition had been organized but before it had opened. Rafael Alberti commented at the time of the exhibition: "The huge nave of the Great Chapel of Clement VI, in the Palais des Papes in Avignon, is always impressive; one might think it was made only so that Picasso could invade it, and make the big walls almost disappear with his works" ("Picasso, The Unending Lighting", 1974, reproduced in, Picasso: Mosqueteros, exh. cat., Gagosian Gallery, New York, 2009, p. 310). The show, in a way, revealed the artist taking his final bow. It was only too appropriate, then, that many of the pictures in the exhibition featured the heads of men who were often analogues for the artist himself. This was the case with the harlequins, matadors, musketeers and artists who populated a number of the pictures, including Tête d'homme (figs. 2 and 3). In the present work, which Picasso painted on 21 January 1972, the hat appears to recall some of the floppy headwear worn by Picasso's dandyish musketeers; at the same time, it echoes the figures inspired by Vincent van Gogh who populated some of Picasso's pictures, especially following his move to the South of France where the Dutch artist himself had lived (fig. 1). Picasso would have been gratified at some of the controversy that the 1973 exhibition in Avignon caused. His recent paintings such as Tête d'homme were often filled with a palette that was almost provocative in its deliberate refusal to pander to public tastes. Instead, Picasso revealed the extent to which he was continuing to push the boundaries of art, taking painting to pieces in order to reconstruct it in new and unexpected ways. His emphasis on the processes involved in creating Tête d'homme is underscored by the brushstrokes seen in the hat that are bold and gestural, while the hair and beard appear almost scribbled and are incised, recalling the art of children rather than that of an old and legendary avant garde artist. Of course, it is in this, his manipulation of the viewer's expectations and understanding of the notion of 'fine art' that Picasso displays himself ever the revolutionary. Even the background has been painted in such a way that the viewer is intensely aware of the brushstrokes themselves. Looking at creating Tête d'homme, Picasso's own movements and actions are recorded in an almost archaeological manner as we trace each stroke and line. Picasso's exploration of painting came from deep in the core of his own existence: by the time he created Tête d'homme, he was a living legend, identified with figurative painting by generations. While figuration and facture, at each end of the artistic spectrum, may have been disregarded by artists who had espoused either abstraction or Pop, Picasso was continuing to probe its relevance, and was doing so in a manner that also explored his own life and legacy. So, in creating Tête d'homme, his own dark eyes seem to penetrate the viewer--here outlined in a bright blue. In addition, his entire head is shaped in a manner that recalls a painter's palette, highlighting his own identification with his artistic vocation. Looking at creating Tête d'homme, the man is wearing a hat and a wild and bushy beard. The hat, which may recall the musketeers, is at odds with the unruly facial hair. This implies that it may be the sort of straw hat that Picasso showed in some of his fictitious projections of Van Gogh, in which he would sometimes show him embracing outdoors, sometimes looking out from the canvas. Certainly, the arresting stare of the figure in Tête d'homme recalls Van Gogh's celebrated and penetrating self-portraits, several of which featured similar straw hats. For Picasso, during this period, Van Gogh had become a spectral companion; he would project images of self-portraits onto the walls of his studio and cherished a photocopy of the clipping announcing in a local newspaper that Van Gogh had cut off his own ear. Many of Picasso's contemporaries had died by the time Tête d'homme was painted, and he was looking increasingly to the artists of the past in order to find companions and inspiration. John Richardson has pointed out, in terms relevant to Tête d'homme, that the example of Van Gogh became all the more vital to Picasso in his later years as, instead of seeking to tap into the vision of the artiste maudit as he had during his Blue Period, he sought a more expressionistic means of painting: "What he wanted was to enlist Van Gogh's dark spirits on his side, to make his art as instinctive and 'convulsive' as possible... I suspect that Picasso also wanted to galvanise his paint surface--not always the most thrilling aspect of the epoch before Jacqueline's--with some of the Dutchman's Dionysian fervour. It worked. The surface of the late paintings has a freedom, a plasticity, that was never there before; they are more spontaneous, more expressive and more instinctive, than virtually all his previous work" (Picasso, quoted in J. Richardson, "L'Epoque Jacqueline," pp. 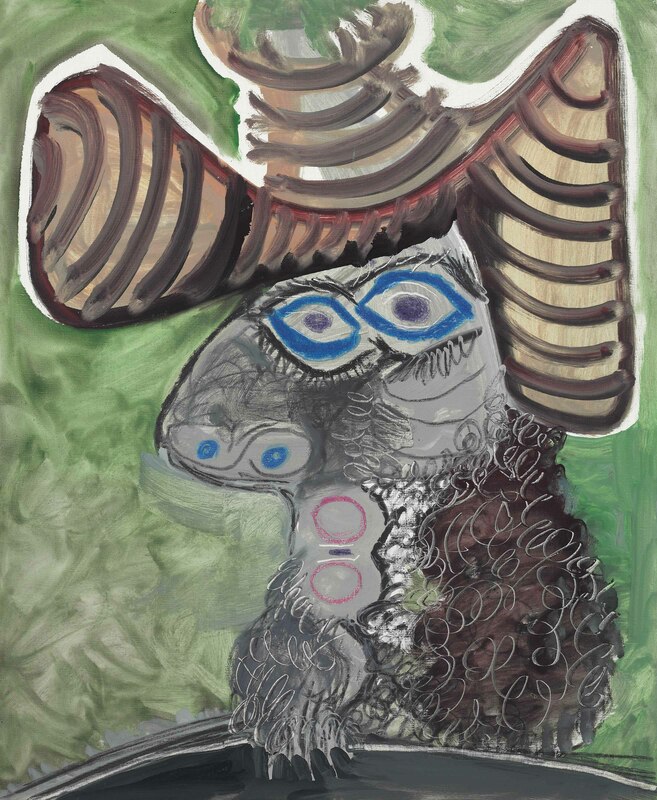 17-48, in Late Picasso: Paintings, Sculpture, Srawings, Prints, 1953-1972, exh. cat., Tate Gallery, London, 1988, pp. 32-34). Tête d'homme was painted some months before the haunting death's-head-like self-portrait that Picasso created and showed to Pierre Daix, which resulted in a number of skull-like images. Here, the sense of play, of costume and of entertainment, is punctured by the gaunt eyes and slender face. The gaze of the man in Tête d'homme is both endearing and imploring, as though he were conscious of his own vulnerability. This results in Tête d'homme appearing as a poignant image of the artist's projected sense of self during that period; it is a telling reflection of its success in Picasso's own eyes that he selected it for what was to become his posthumous show in Avignon the following year.